Firstly using clean hands run your fingers over the fish to ensure there are no bones present. Place the fish in a shallow pan and cover with milk, poach over a low heat for 8 – 10 minutes until the flakes are just beginning to break away. Add the spinach and cook for a further minute or two. Remove the spinach from the broth and dice, place in the bottom of the ramekin (baking bowl). Using a fork gently break the fish and check again carefully for bones. Place a layer on top of the spinach. Top with the sweet potato puree and serve immediately. 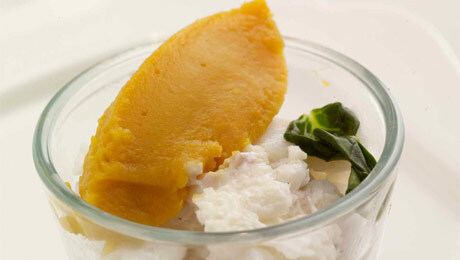 This dish can be fully pureed for babies who are not yet ready for too much texture. Just add a little low salt vegetable stock or milk.